Birks takes home a diamond international award. Birks takes home a Diamond International award, one of the world’s most prestigious diamond awards, for La plume de Cyran. 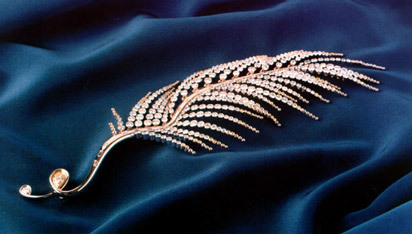 An exquisite gold and diamond brooch created by Annik Lucier in the Birks design studio. Birks also collaborates with numerous designers who win distinctions for their works, including Toni Cavelti and Marion Cameron.